915 Royal Moon. Welcome to this stylish home situated on a premium lot with sparkling pool. 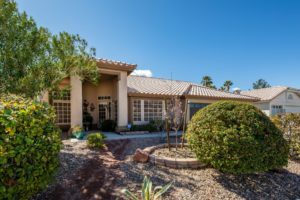 Enjoy the active setting of the Silverado Ranch area featuring premier parks, miles of trails, and exciting recreation as well as close proximity to the Fabulous Las Vegas Strip. You are welcomed by inviting curb appeal enhanced by attractive landscape, accent boulders, raised planters, and a covered front porch with custom screen door. Home is open and bright flowing perfectly to create an ideal space for relaxing or entertaining. Natural light pours in through the many windows. Updated kitchen is treated to quality cabinetry with trim work, black granite counters, and stainless-steel appliances. Kitchen also offers the convenience of a dining nook looking out to the pool. Restful master suite features a patio door to pool. You will fall in love with the spa inspired bathroom enhanced with glass shower, oval tub, dual vanity, and spacious walk-in closet. Flexible layout features three additional bedrooms, on of which has been upgrade with custom built-in cabinetry and desk. Tasteful decor includes new decorator paint, quality carpet with plush pad, stone pattern tile, hardwood laminate, shutters, art shelves, vaulted ceilings, and ceiling fans. Convenience features consist of updated AC unit, updated water heater, programmable thermostats, and many storage options including a convenient shed. Peaceful rear yard oasis is perfect for entertaining or relaxing. Yard is highlighted by a refreshing pool, covered patio with fan, and wood adorned block walls.